Some of these pathogenic organisms are spores such as Bacillus and Clostridium which withstand pasteurisation. These spore-forming micro-organisms are difficult to kill by heat and by using traditional cleaning processes. 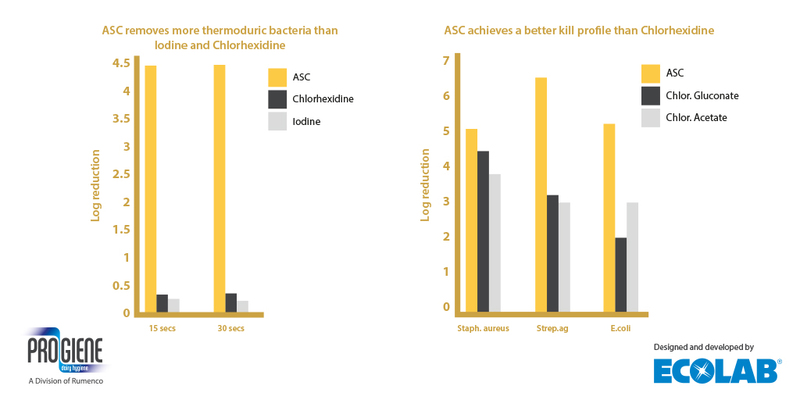 Thermoduric bacteria are prevalent in the cow’s environment with them accumulating in silage, slurry, soil and bedding. These bacteria find their way onto cow’s teats and are transferred onto the milking equipment and then into raw milk. Housed animals are more of a risk but soil contamination from cows at grass should not be overlooked. Once these teat skin commensals find their way into the milking equipment they can create a biofilm where micro-organisms stick to each other and then onto surfaces, creating a residue which is invisible and often difficult to remove. As prevention is always better than cure, and the main initial cause of contamination comes directly from teat surfaces, care should be taken to keep cow housing as clean as practically possible and to adopt some form of thorough teat disinfection routine in the parlour, prior to cluster application. Lack of good teat hygiene at this stage is the primary reason that milk supplies can become contaminated with spore-forming bacteria. ·	Is the collecting yard clean? ·	Is the cow entering a clean parlour? ·	Are tails trimmed and udders clipped? ·	Are cows coming into the parlour with clean flanks, teats and feet? ·	Are you wearing clean gloves to milk? ·	Are you pre-dipping or foaming teats (not udders!) with an approved disinfectant? ·	Are teats thoroughly dry before the unit is applied? ·	Is the cluster clean? ·	Are you keeping the parlour environment free from slurry aerosols?